Vetrocalm Intense INSTANT provides horse owners with fast acting targeted nutrition to support a calm and relaxed outlook in horses prone to tension, nerves, excitement or anxiety. Vetrocalm Intense INSTANT is scientifically formulated using an enhancement of the oxygen technology first used in Equine Oxyhsot and is free from banned substances making it particularly useful when equines are faced with intense circumstances such as competition days, new situations and traveling. 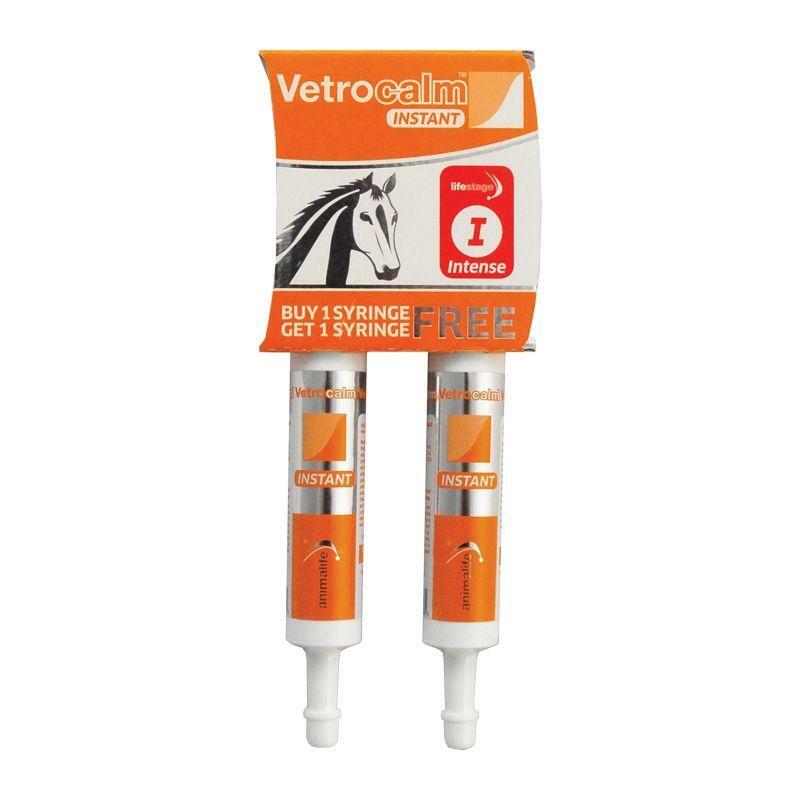 By utilising the renowned Oxyshot oxygen technology, Vetrocalm Intense INSTANT supports the replenishment of oxygen in the blood to help horses deal with stress, fear, anxiety and tension. When under intense pressure lactic acid can build up and the unique oxygen formulation in Vetrocalm Intense INSTANT supports the body’s natural ability to oxidise this lactic acid. Quickly absorbed to provide quick results. Can help reduce spooky behaviour, negative responses to new environments and general anxiety. Helps support the physical responses to stress, fear and excitability – such as tension, lack of concentration and poor performance. Easy to administer on the day it is required, with no loading serve. Vetrocalm Intense INSTANT is administered via an easy-use syringe approximately 30 minutes before activity and can be used every 2 – 3 hours as required. Best given on a empty stomach. Vetrocalm Intense INSTANT contains Sodium chloride (Atlantic) 0.4% and De-ionised water. Formulated with Specially Optimised Bioavailable Formula (SOBF) technology. Does not contain magnesium or tryptophan. Free from banned substances. Buy 1x 25ml syringe get 1x 25ml syringe free promotional twin packs. We recommend that Vetrocalm Intense INSTANT is administered on an empty stomach at least 30 minutes before activity. Using Vetrocalm Intense INSTANT before travelling has been shown to reduce stress levels in horses during and after transportation. Vetrocalm Intense INSTANT can be used both before exercise to support behaviour during intense activity and after to promote recovery.